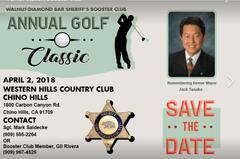 Captain Al Reyes and the Walnut-Diamond Bar Sheriff's Booster Club cordially invite you to participate in the 2018 Walnut-Diamond Bar Sheriff's Booster Club Annual Golf Classic. 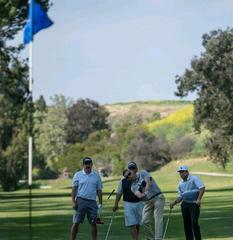 This year's event will be held on April 2, 2018 at the Western Hills Country Club, 1800 Carbon Canyon Rd, Chino Hills. 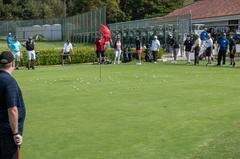 Registration will be from 9:30 am to 11:15 am with a Shotgun Start at 11:30 am. The proceeds benefit the hard working Sheriff Explorers, Volunteers and Reserve Deputies who play such a vital role in the service of our communities. "Our station has one of the finest volunteer programs in Los Angeles County. The program has over 100 volunteers who proudly serve our communities in various capacities. Our volunteers　participate in programs such as Volunteers on Patrol (VOP), Sheriff’s Reserves, Sheriff’s Explorer Scout program and communications support. Each of these volunteers provide thousands of hours of enhanced public safety by providing extra patrol, staffing at community events, and internal clerical support for our station. I humbly ask for your participation in sponsoring this event. Your tax deductible donation will help us purchase equipment and supplies for all of our volunteer programs so that they will continue to be the finest in all of Los Angeles County." Captain Al Reyes. For further information regarding player registration and/or being a sponsor, register online at http://www.walnutstationboosterclubgolf.org or contact Sgt. Mark Saldecke 909-595-2264 or Booster Club President Gill Rivera 909-967-4525.